The INR 11.98 billion Chenab Rail Bridge, which is under construction, is located between Bakkal and Kauri in the Reasi district of Jammu and Kashmir (J&K), India. At 359 meters above the river bed, the rail-arch bridge will be the highest in the world and, with an arch span of 467 meters and 1,315 meters in length, the longest span-exclusive, broad-gauge rail line and seventh longest single span bridge. The alignment crosses the deep gorges of the Chenab River near Salal Hydro Power Dam, which necessitates the construction of a high, long-span bridge. A steel arch configuration was chosen for the aesthetics, economy, and availability of local expertise and construction materials. The bridge site selection was based on important technical and geological parameters, such as the narrow valley at the site, competent rock mass at each bank, favorable orientation of joint sets, straight reach, and river flow without cross-currents. The project faced several challenges, such as slope stabilization, high-wind, extreme weather, seismic activity, and possible terrorist attacks, which required the bridge to be built to withstand 260-kilometers-per-hour wind forces, blast impact loads, and temperatures below -20 degrees Celsius. Sophisticated train control and bridge monitoring are also required to ensure train regulation for wind speeds, earthquake activity, and strain gauging of critical steel components. Construction must be done with cable cars, using the world’s longest span cable crane. 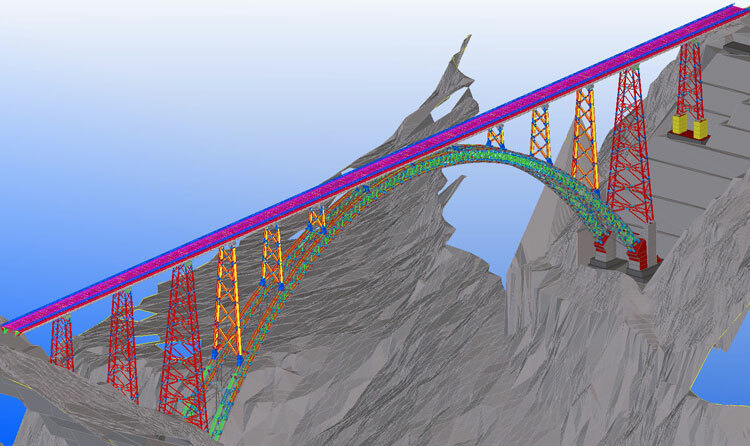 The organization used OpenRail Designer to meet the rigorous rail alignment demands, OpenBridge for bridge planning and analysis, and STAAD for structural behavior analysis of the massive bridge. ContextCapture was used for construction planning, monitoring, inspection, and surveying. The application was critical in managing the construction site progress and conducting inspection during construction to accelerate the project and ensure quality, repeatable documentation of the bridge inspection. ContextCapture helped save 225 days in surveying, equating to US$40,000 in savings, and reduced construction inspection time by 80 percent, resulting in savings of more than US$100,000. As one of the first rail railway bridge projects in India to adopt the latest technology to traditional survey and construction work, the success of this iconic project will change traditional workflows and will trigger the use of modern tools in similar projects worldwide.